HERALD WAR REPORT: News, notices and adverts from the Morpeth Herald, March 17, 1916. In this feature to commemorate the First World War, we will bring you the news as it happened in 1916, as reported by the Morpeth Herald. All material is published with kind permission of the Mackay family. We thank them for their support and generosity in allowing us access to their archive. 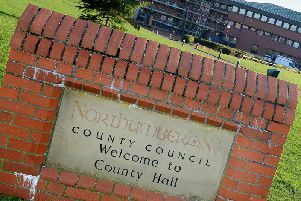 The monthly meeting of the Morpeth Town Council was held on Tuesday night. The Mayor (Ald. Ed. Norman) presided). The Mayor stated that he had received a letter from the War Office intimating that it was their intention to send to the town a captured German gun. (Hear, hear.) It was expected that it would arrive in the Borough on March 22. They wanted the Council to make the best use of it, and if possible to hold a demonstration on the day that the gun arrived. They had written to the commanding officer to give the Council all possible assistance and place the service of the troops stationed in the town and neighbourhood at their disposal in order to make the demonstration a success. He hoped the gun would arrive on the Wednesday, because it would be a good day, so many of the country people being in the town on that day. The gun, he added, was a ton weight. He asked if any of the members had any suggestion to make with regard to the demonstration. Mr Armstrong: Where will you place the gun? Mayor: In the Market Place. Mr Armstrong: Is there any arrangement for the military to protect it. Mayor: I expect the military will furnish a guard. Mr Charlton suggested, as the time was short, that a small committee be formed to help the Mayor to make the necessary arrangements in connection with the proposed demonstration. It was only fitting that the whole thing should be carried out well. He proposed as the committee:— The Mayor, Alderman Brown, Councillors Duncan and Simpson and the Surveyor. Mr Armstrong seconded the proposition, which was carried. The Mayor announced that as soon as he heard definitely from the War Office as to the date of the gun’s arrival he would let the councillors know as soon as ever possible. He hoped that they would rally round him and make the demonstration a success. Ald. Brown suggested that Ald. Carr be added to the committee. Mr Charlton moved Ald. Carr’s name. Mr Armstrong seconded, and it was agreed to. The committee also reported that the Town Clerk had submitted a letter from the Manchester Corporation with copies of a resolution not to contract with foreign firms.— It was recommended that the Council pass a similar resolution, which was carried. The committee recommended a person be added to the list of those persons exempted from payment of rent whilst her son was serving with the forces and that the Mayor, Ald. Carr, and the Surveyor inquire and report to the Council upon the whole of the exemptions granted with a view to revision of the list.— This was agreed to. I am instructed to advise you that arrangements have been made for the dispatch of a captured German gun to you on loan, to arrive on the 22nd inst. It is requested that the most be made of the reception and exhibition of the gun whilst in your town, and with this object in view, it is suggested that a public reception be arranged and the gun placed in a conspicuous position. No doubt, arrangements can be made for the proper protection and care of the gun whilst in your custody, which will be for a period of one month from the 22nd inst. As far as is known, the approximate weight of the gun is one ton, and no limber on drag ropes are attached. Notification will be sent you of the time of arrival of the gun (by rail) at the earliest possible moment, and a copy of a letter addressed to the O.C. troops in your town, asking him to afford any assistance you may desire in organising the reception, is attached. “I am glad to let you know that I am much better than I might have been, owing to a German shell bursting in a dug-out we were in. Me and the other six were just having a few minutes to ourselves before getting tea. The Germans were busy shelling us, and we were sitting listening, when all of a sudden a 28-pounder came through the end of the dug-out. “The man that was sitting with me on the seat on my left was killed outright. It must have just missed me, and poor Billie Bothwright must have got the full weight of it. The other five were wounded and are in hospital. You know Bob Mills, who was at Morpeth one time when I was on leave, he was one of them who was wounded. He got a nasty bat in the eye, which was completely closed. Two of them suffered very much from shock. The other three were wounded, and I thank God for the way I got clear. “I was buried up with a roof over me. I only got my nose and one of my wrists scratched. I don’t know how I gathered the strength, but when I saw how things were, and saw the other poor fellows lying wounded, I took two of them to the dressing station under shell fire. I shall never forget it. “I am glad to tell you that I met Billie Lamb, and he looks very well. When we shook hands I could not help laughing at him. His nose was scratched like mine. I asked him what he had been doing. He said it was done by the barbed wire. “He went on to try and find Arthur Turner, but could not find him, so we had to part once more. He said he was going to his headquarters, so he would see Jim O’Hare. I haven’t seen him this time. I met another Morpeth boy who has just come to our battalion — Sproat, the carter’s son, of Oldgate. I did not know him at first. A big, fine fellow he is, too. Charlie Wood was with him. A very interesting letter has been received from Mr A. Swan, of Broomhill, from his son, Corporal George Swan, who is at present in France. He speaks of having a very exciting time. Corporal Swan has under him a band of snipers, who, he says, have done more damage this week than ever before, and he had been complimented by his superior officer for the work that had been done in the way of sniping by him and his company. Corporal Swan goes on to say:— ”On another night I was out towards the Hun trenches and saw a working party, so we got the machine gun into action, and I expect we did some damage, as I gave them the exact position. Two Huns came in sight together another morning, and one of our snipers shot the second one flat. You ought to have seen the other one dive for cover. Corporal Swan speaks of the weather being very bad at the front. Sir,— Will you kindly insert this appeal in a small space in your paper which is very much appreciated by the boys of Morpeth and District out in France. Private C.J. Habberjam, N.F., of Hirst, has died of wounds. Private R. Wills, N.F. of Ashington, has been killed. Corporal Arthur Chapman, 6th N.F., son of Mr S. and Mrs Chapman, 18 Delaval Road, Forest Hall, has been killed in action. Pte. James King, of Blyth, a coal trimmer, who died in hospital at Ashington, was given a military funeral at Cowpen on Sunday last. Mrs Louisa Strong, George & Dragon Yard, Morpeth, has received an intimation from the War Office that her son, Bomb. Robt. Strong, 10th Batt. Durham Light Infantry, is in hospital suffering from a gun-shot wound in the face. Mrs W. Bowman, of 10 Sinker’s Row, Dinnington Colliery, has received an intimation that her husband, Pte. W. Bowman, a stretcher-bearer in the 8th East Yorks, has been killed in France. Mr and Mrs Watson, New Barns Farm, Warkworth, have received information that their son, Private James Watson, 7th N.F., was killed in France on February 14th by the bursting of a shell. Official information has been received by Mr Thomas Anderson, Fore Brigade Station, Alnwick, that his son, Private William Anderson, 1/7th Northumberland Fusiliers, has been killed in action. Mrs V. Miles, Chapel Lane, Alnwick, has been informed that her husband, Private Hugh Miles, 1/7th N.F., who was reported missing on April 26th, has been killed in action. Private John Besford, son of Mr Thomas Besford, a well-known Cowpen miner, has died in hospital in France from illness. He has only been a short time in France. He was recently visited there by his parents. Deceased was only 25 years of age, and was in the Northumberland Hussars. COWEN.— Killed in action in France on February 20th, 1916, Private T.H. Cowen, dearly-beloved husband of Julia Cowen, Routledge’s Building, Barrington.— Deeply mourned by his dearly-beloved wife, son and daughter. Also Deeply mourned by father and mother, brothers, and sisters-in-law and brother-in-law, Pte. J.W. Richardson, now in France. GEGGIE.— Killed in France on 26th April, 1915. Lance-Corporal George William Geggie, 1/7th Northumberland Fusiliers, son of Mr George Geggie, Blue Bell Hotel, Amble. “In many industries women have been very largely engaged to do the work hitherto done by men. In many occupations this cannot be considered an evil, as women have as much right as men to opportunities to earn their own living. By being thus placed in a more independent position they would develop a better womanhood, which would result in a better race. “While this is true regarding occupations which would not injure them physically or morally we ought, for the future well-being of our country, to refuse to be any party, unless compelled by sheer necessity, to the employment of women in occupations which will tend to reduce their moral status, and so affect them physically that the motherhood of the nation will be depreciated. “These latter considerations have, during the whole coal history of Northumberland, so far as can be ascertained, kept women from working either underground or on the surface at our mines in this country, except in granaries and in colliery offices. “We feel this physical and moral danger to be such that, as we have said, nothing but sheer necessity should make us agree to women being so employed at the present time. We have no evidence up to the present that this necessity has arisen, and even if there is a growing scarcity of surface labour we believe that there are a number of old men, who ceased work because there was no work for them, and also younger men in receipt of part compensation, who would accept jobs at light work about the surface of our mines, if such were offered to them, for the period of the war. Officials of local lodges are called upon to assist in providing facilities for the return to work — surface work chiefly — of men who have ceased work at the collieries. There is a very large number of men who under the circumstances would be quite able and willing to “do their bit” in the nation’s crisis. In another column will be seen an appeal from the boys of “A” Company, 2nd Tyneside Scottish, “Somewhere in France,” requesting kind friends to send out a musical instrument and games to while away the dreary nights in the trenches. In addition to their appeal they forward to us the following amusing epistle, which shows the splendid spirit which animates our men in the trenches. Here is what they say: “You may think we have no football matches out here, but we have the finest team in the world — ready to play all-comers. If you don’t mind we will tell you our team. “George Ground is our goalkeeper, and stops some very strong shots. Then come our backs, Sam Sandbag, who never gives an inch of ground, and Bob Barbwire, a player with whom you always get entertained. Then we have our half backs, a fine trio — Jack Starlight, an illuminating player, who enlightens all spectators; Jack Sniper, a quiet fellow, who is always potting at goal and seldom fails to score; and Pipsgeak, who puts in some useful work. “As for the forwards, we have Harry Rifle, a very cool player indeed; Walter Bayonet, a very dangerous chap at close quarters; Joe Whizbang, who comes in with a crash; Jack Shrapnel, who is up and down the field in grand style; and Bob Grenade, who does some very clever work. A pretty wedding took place on Saturday last in Morpeth Parish Church, the contracting parties being Sapper John Marley Kelly, of the 3/1st N.D.S.R.E., the second son of Mr and Mrs P. Kelly of Hood Street, Morpeth, and Miss Margaret Alice Dewell, of New Shildon. The officiating clergyman was the Rev. Frank C. Hardy. The bridegroom will return to his military duties early next week. Dear Sir,— This week I have sent to the Morpeth “Boys” of the 7th N.F. (Somewhere in France) 10 parcels (each 7lb) of “comforts” and containing 1½ gross of chocolate bars, chewing gum, Rowntree’s clear gums, assorted biscuits, sardines, mixed pastes, 1,000 cigarettes, safety matches, carriage candles, soaps etc.. I wish to thank Mrs Smail, Bridge Street, for gift of candles; Mrs James Whittle, chemist for gift of “comforts;” and Mrs Urwin, The Nest, for socks. “When Will the War End?” is the chief topic to which Mr W. Straker addresses himself in his monthly circular to the members of the Northumberland Miners’ Mutual Confident Association. All answers to the question, he says, are merely guesswork, but one thing is fairly sure, and that is: the common people will have as little to do directly with the ending of the war as they had to do with the commencement of it. Yet there may be forces generated by the people which may play a wonderful, though unmeasured, part in the question. The growing desire for peace, not only in our land, but in every land where there are those who have dear ones exposed to the same dangers as our own. “Add to these the strong desire for peace by the peoples of neutral countries, who, in many cases, are suffering severely in many ways while the war lasts, and we have such an accumulation of desire for peace that there is created, what may be termed a Vivpyshic atmosphere against which neither statesmen nor diplomats are impervious although unconscious of its operation. Thus indirectly, the people may exercise a very determining influence in bringing the war to an end. “I am afraid,” he proceeds, “that the belief in the power of prayer has in recent years been on the wane for the simple reason that in the hurry and bustle of modern so-called civilisation, prayer has fallen into disuse. Not only this, but the modern idea of ‘getting-on’ in the world by out-scheming and over reaching others has made us afraid to submit our doings to a God of justice and love. There is, however, an awakening to the necessity of prayer, not merely and not principally, among professions of religion, but among those who are suffering though the loss of some, and the anxiety about others. “I am not thinking of men in high positions of State in the different nations whose God is merely a tribal God of battles, and whose prayers are but appeals to such a God to give them victory over their enemies. I am thinking of earnest men and women who are turning to the Great All Father for direction as to how the spirit of Jesus Christ can be applied to all the problems of life, but this war in particular. “I am convinced, matterless how some others may smile at this as a mere superstition, that by a unity of such prayers spiritual forces will be set in operation which will make powerfully for peace on earth and good-will to men. “Among our members and their families there are large numbers of members of various churches. These I would recommend to become associated with ‘The Laymen’s Christian Crusade.’ Men of all religious denominations have joined it, and many of the great religious thinkers and others have given it their blessing. “Just as it is fashionable to sneer at the power of prayer, so it is fashionable to sneer at the right of conscience. So we have many writers to the Press applying the most despicable terms to men who go before the Tribunals asking the exemption provided for them in the Compulsory Military Service Act, on the ground of conscientious objection to all forms of military service. “I quite recognise the difficulty the Tribunals must be in when such objectors appear before them as it is an utter impossibility for any man to judge another’s conscience, but I do submit that the questions put in many cases are unfair, insulting, and of such an extreme kind that it is an impossibility for any man to say what he would do were he ever brought up against the hypothetical circumstances suggested by the questioner. “The fact is that questions of the kind asked in these cases reduce the provisions of the Act to meaningless terms, and the refusal of the Tribunals to grant exemption in the face of the position put by the applicants in many cases makes the Act, so far as conscientious objectors are concerned, null and void. “The fact is that it is an impossibility for any man to prove his conscientious objection to anything, other than by suffering the penalty of having a conscience. The New National Economy Campaign, says Mr Straker, was inaugurated on the 1st inst. by a large meeting in the Guildhall, London, and when reading an account of this gathering he could not help wondering how many of these “lords of creation” had travelled to London in a first-class railway carriage when they might have economised by travelling in a third-class, and how many of them had driven to the Guildhall in a motor-car when they might have gone in a ‘bus’ for a few coppers. Great as the need doubtlessly is for economy, as the time may come quickly when the difficulty of the working-class mother to provide necessaries for her children may be even greater than previous to the war, yet suggestions such as made and applauded at the Guildhall meeting will not prove the best way to appeal to the people. With regard to working-class savings, Mr Straker says: “Two things seems to me to be necessary to induce working men to place their small savings with the Government. One is to pay the same interest to the small investor as to the large investor. I quite appreciate the greater-cost argument against this, but I recognise that unless this is done a feeling that they are not fairly treated will be held by the working men. “The other is that provision must be made to enable the working man to withdraw his money should pressing need arise. The wealthy man who invests money always has sufficient available to meet the needs of his family when sickness and other family troubles arise, This is as it should be, therefore the working man should be able to secure his savings for the same purpose.